A romantic walk down a cherry blossom filled path. 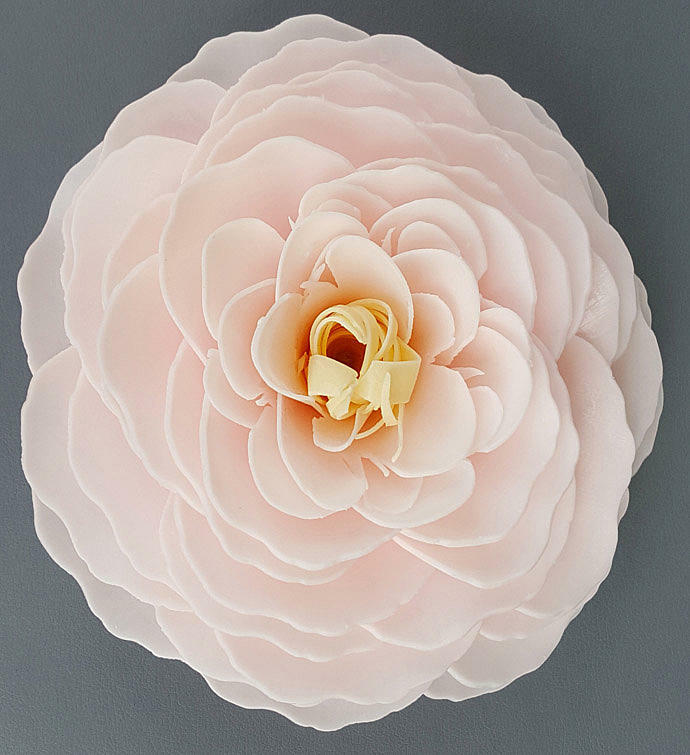 The vintage look of the garden rose gives this flower a soft, delicate feel. The cherry blossom scent is wonderfully blended to create a perfect spring scent. Fragrance Tender cherry blossom, sensual white lily and blushing violet petals blended with a hint of warm vanilla. This is our fullest flower design with 35 or more hand-cut, hand-pieced petals. Use one petal for an average of 10 hand washes, bathing, shaving, guest soap or a travel soap. The creamy petals moisturize while cleansing. Using a single hand-pieced petal means that the rest of your flower stays together for the next experience. Shimmer tips. Almost 5 inches in diameter and approximately 3 inches high. 97% Natural Ingredients List Saponified Vegetable oils mainly Coconut Oil, Glycerine (kosher, vegetable origin), Mango Butter, Goat's Milk, Purified Water, Sorbitol (from berries), Sorbitan oleate (from vegetable source), Soybean protein, Titanium Dioxide (mineral whitener), Fragrance, Color (All of our fragrance oils are phthalate free) Take in the aroma and choose one petal to use for many hand washes, creamy bathing or shaving, as a guest soap, or travel with a few of your petals on the go. Enjoy the creamy, soft lather of bathing petals. Store at room temperature. Handmade with care Each bloom is uniquely made with artisan skill. The maker places each petal, one by one, into the flower. We use our handmade process developed over years to ensure that we send our very best handmade blooms to you every time. A romantic walk down a cherry blossom filled path. Hand-pieced bathing petal soap flower with cherry blossom scent that is wonderfully blended to create a perfect spring scent.